Jackfruit Seed is highly nutritious and I generally collect & refrigerate them whenever we buy the jackfruit. We get in Singapore during this season mainly. The fiber in the seed helps fill you up, making it easier to lose weight, and may lower your risk for heart disease, high cholesterol, high blood pressure and constipation. Jackfruit seeds also provide resistant starch, which may help improve blood sugar control and keep your gut healthy. 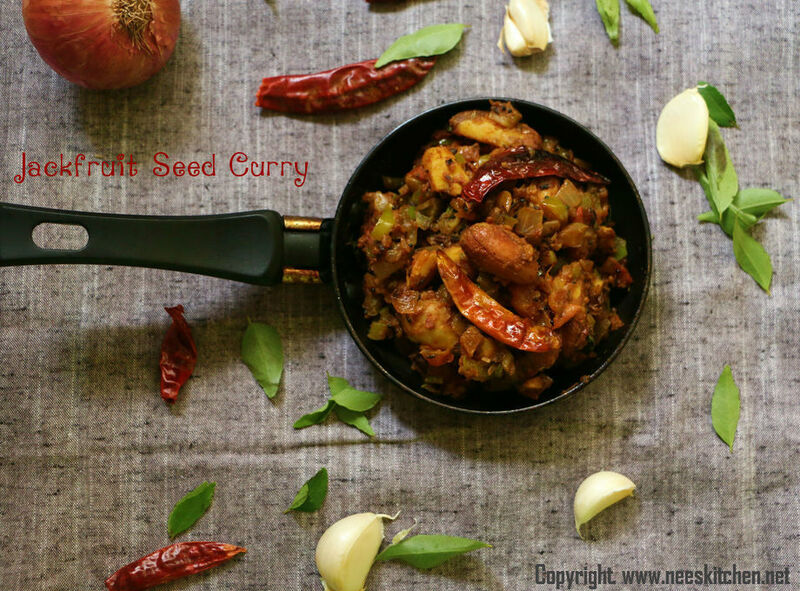 There are various ways in which you can cook this seed and this post is a simple tomato based curry which goes well when we mix with plain rice or with curd rice. 1. Pressures cook the Jackfruit seed for 4 whistles with enough water. 2. Peal the outer skin and cut into ½ length wise. 3. Take a pan and add the ingredients mentioned in “To Temper” Table in the order given. 4. Add onion and sauté for 2 mins. 6. Add tomatoes, turmeric, coriander seed powder, sambar powder and salt. 7. Let it cook nicely until the tomatoes become soft and the masala mixes well. 8. Add the jackfruit seed at this stage and let it coat nicely. 9. Add besan flour and let it get coated nicely. Jackfruit curry is ready to be served. You may replace Sambar powder with chili powder. The jackfruit seed must be completely cooked in pressure cooker. Capsicum can be replaced with drumstick. Cooking time would slightly vary.